For the film, see Libby, Montana (film). Libby is a city in and the county seat of Lincoln County, Montana. The population was 2,628 at the 2010 census. Libby is located along U.S. Route 2. According to the United States Census Bureau, the city has a total area of 1.95 square miles (5.05 km2), of which 1.91 square miles (4.95 km2) is land and 0.04 square miles (0.10 km2) is water. 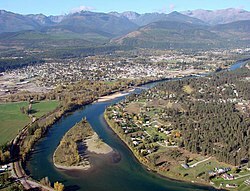 Located in the Kootenai National Forest, between the Cabinet Mountains to the south and the Purcell Mountains to the north, the town lies in the heart of the Kootenai Valley along the Kootenai River, and downstream from the Libby Dam. Libby is at an elevation of 2,096 feet (640 m) above sea level. Libby experiences a continental climate (Köppen Dfb). As of the census of 2010, there were 2,628 people, 1,252 households, and 647 families residing in the city. The population density was 1,375.9 inhabitants per square mile (531.2/km2). There were 1,416 housing units at an average density of 741.4 per square mile (286.3/km2). The racial makeup of the city was 95.9% White, 0.1% African American, 1.1% Native American, 0.4% Asian, 0.3% from other races, and 2.1% from two or more races. Hispanic or Latino of any race were 2.5% of the population. There were 1,252 households of which 23.2% had children under the age of 18 living with them, 36.7% were married couples living together, 11.1% had a female householder with no husband present, 3.9% had a male householder with no wife present, and 48.3% were non-families. 41.9% of all households were made up of individuals and 19.1% had someone living alone who was 65 years of age or older. The average household size was 2.02 and the average family size was 2.71. The median age in the city was 45.8 years. 19.1% of residents were under the age of 18; 8.4% were between the ages of 18 and 24; 21.4% were from 25 to 44; 28.6% were from 45 to 64; and 22.5% were 65 years of age or older. The gender makeup of the city was 48.6% male and 51.4% female. Libby's economy had been largely supported in the past by the use of natural resources such as logging and mining. Mining and timber mills have since closed down. Tourism is playing an increasing role in the local economy. 17 miles (27 km) upstream from Libby is the site of the Libby Dam, one of the Columbia River Treaty Dams, finished in 1975. Libby is also known as the "City of Eagles". Several eagle sculptures can be found all around town, including a 60-foot (18 m) eagle at both ends of town. In the mid 1980s, a major ski resort was proposed for Great Northern Mountain, twenty miles (30 km) south of Libby. In 1919, Vermiculite was discovered in the mountains near town. By the time W. R. Grace and Company bought the local mine, it was producing 80% of the vermiculite in the world. Because the local vermiculite contains asbestos, and the mine's byproducts were used in local buildings and landscaping, the town suffered from an extremely high rate of asbestosis. Nearly 10% of the population died from asbestos contamination, and the federal government later charged company officials for complicity. On Friday, May 8, 2009, W.R. Grace & Co. was acquitted of charges that it knowingly harmed the people of Libby. It was also acquitted of subsequently participating in any cover-up. Fred Festa, chairman, president and CEO said in a statement, "the company worked hard to keep the operations in compliance with the laws and standards of the day." As of 2015, the U.S. Environmental Protection Agency (EPA) was concluding the removal of asbestos-contaminated soils and other suspect materials in and near Libby. and has spent $425 million in Superfund money on cleanup. On June 17, 2009, the EPA declared its first public health emergency, which covers Libby and nearby Troy. It had provided an additional $130 million in cleanup and medical assistance. The 2010 Patient Protection and Affordable Care Act includes a provision which provided Medicare coverage to individuals of such public health emergencies. Libby, Montana is a documentary film about this matter, released in 2004. Libby is served by the Libby School District. Amtrak serves Libby through a local station. U.S. Route 2 and Highway 37 meet at a traffic light in the center of town. The 1989 film Always, directed by Steven Spielberg, was shot in and around Libby and its airport. Libby is referenced by an eagle-headed Soldier in the team-based shooter, Team Fortress 2. ^ "Monthly Averages for Libby, MT". The Weather Channel. Retrieved January 15, 2011. ^ "Census of Population and Housing". Census.gov. Archived from the original on May 12, 2015. Retrieved July 19, 2016. ^ Sher, Jeff (March 4, 1984). "Super resort envisioned". Spokesman-Review. (Spokane, Washington). p. B1. ^ a b Joanna Walters (March 7, 2009). "Welcome to Libby, Montana, the town that was poisoned". The Guardian. ^ a b "Asbestos cleanup 'emergency' declared in Montana town". CNN. June 17, 2009. Retrieved December 22, 2009. 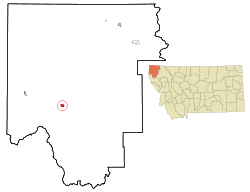 ^ "Libby, Montana: Health Risk Remains In Asbestos-Plagued Town". Huffington Post. May 3, 2011. Retrieved July 5, 2011. ^ "Libby Asbestos". Huffington Post. May 4, 2011. Retrieved July 5, 2011. ^ "Petition For Writ of Certiorari, W.R. Grace & Co., Kootenai Development Company, and W.R. Grace & Co.- Conn, petitioners" (PDF). April 27, 2006. Retrieved August 4, 2010. ^ Pear, Robert (December 20, 2009). "Deep in Health Bill, Very Specific Beneficiaries". The New York Times. Retrieved December 22, 2009. ^ Werner, Erica (December 21, 2009). "Libby is big winner in Senate's mammoth health care bill". Associated Press. The Missoulian. Retrieved December 22, 2009. 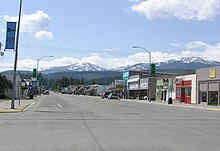 Wikimedia Commons has media related to Libby, Montana. This page was last edited on 23 April 2019, at 02:31 (UTC).